For years many have thought of Kia as nothing more than a low cost brand, catering to those who don’t give a crap about cars and who require only a daily commuter. But we’ve kept a close eye on Kia in more recent years and if you’ve done the same then you’ll know just how far the Korean brand has come. It is still a value-packed brand? Yes, to an extent, but it’s anything but cheap. In fact, Kia’s design chief is the guy who designed the first generation Audi TT. Not exactly a lightweight, and the Kia Cadenza is proof of the brand’s newfound status. 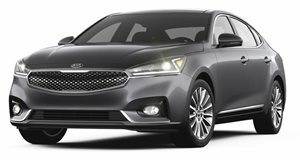 The outgoing 2016 Cadenza is also an incredible bargain at the moment if you’re looking for a full-size premium sedan. What’s the competition? There’s the Toyota Avalon, Nissan Maxima, Buick LaCrosse and even the Lexus ES350. Directly compare the Cadenza and ES350 in regards to features and final price, and you’ll clearly see why Lexus is paying attention to its now new South Korean competitor. The Cadenza will make buyers question just how much that Lexus badge is really worth. Does the Cadenza lack at least some of its competitor’s refinement? Yes, but not nearly as much as you’d think. Our Cadenza tester, powered by a 3.3-liter V6 with 293 hp and 255 lb-ft of torque, was the fully equipped Limited model and, despite a redesigned 2017 Cadenza just now hitting dealers, we’d still wholeheartedly recommend this car. Special thanks to DGDG.com for letting us film the car.